Mr. Brown was in his seventies when he first started attending the church I served in Harrodsburg. He came with a friend. He was a stocky man. He had a marine corps emblem tattooed on his forearm and I later learned that he had been a drill sergeant in the Marines. Even in his seventies he looked the part. He had been married but it had ended badly many years before. He had grown children that lived elsewhere in Kentucky and grandchildren that he didn’t see nearly as often as he would have liked. He was a nice guy, but had little background in the church. About a month after he started coming to church, he had a heart attack and subsequent by pass surgery. I saw him several times in the hospital and got to know him pretty well. “When I am able to get back to church, I want to be Baptized. It is time that I gave my life to Jesus Christ.” And sure enough, as soon as he could get back to church, he asked me to Baptize him. He wanted to be immersed which meant that we needed to go to the Christian church a couple of blocks away, because they let us use their baptistery. So we scheduled a Sunday afternoon, and invited the congregation to join us and as Mr. Brown and I stepped into the Baptistry, he said to me, “Preacher, you’ll need to hold me under a good long time because I really need it.” When the Baptism was done, I said to Mr. Brown, “This is a great day of celebration.” And he looked at me, and with tears in his eyes, he said: “It would have been a greater celebration 60 years ago. It would have made a big difference in the way I chose to live my life. I don’t know why I waited so long. I wasted so much of my life.” You see, many of us pray all of our lives “Thy Kingdom come. Thy will be done” but take the same approach to the Kingdom of God as Mr. Brown did. We put it off. We delay its coming as long as we can. As young people, we put it off while we experience new things in life – sow our wild oats. Live it up. And then we start careers and we marry and we start families. And the Kingdom gets pushed aside by changing diapers and concerns about making ends meet. And then its striving for a comfortable life for ourselves and our families, and the Kingdom of God is pushed away by the need to succeed in the kingdom of this world. And then there’s retirement. And grandchildren. And travel. And nothing is wrong with any of that. Unless they take priority over the Kingdom of God. Unless they push it away. Jesus told a parable about the Kingdom in which He compared it to a King sending out invitations to come to the palace and join in a great feast, but everyone had a reason not to come. One said, I just bought some property, I need to go and check on it first before I can come and dine with the king. And another said, “my father is near death. I need to go bury my father before I can come and dine with the king.” And so how does the king respond? Well he issues the invitation again. But this time it goes to the poor and abused, the outcasts, who don’t have a lot of worldly distractions. In the first chapter of his gospel, Mark reveals to us what the Kingdom of God is all about when he tells us about the baptism of Jesus, and then Mark says: Jesus came to Galilee, preaching the gospel of the kingdom of God, and saying “The time is fulfilled, and the kingdom of God has come near. Repent and believe in the Gospel.” But He soon made it clear that it was not the kind of Kingdom the people were expecting. They believed the Messiah would summon a great army and establish a kingdom of might. And according to Jesus, such a Kingdom was near. But had they truly listened, they would have understood the Kingdom in a very different way. And so we should not pray these words, The Kingdom come. Thy will be done. On earth as it is in heaven until we truly understand that in doing so, we are inviting God’s Kingdom to come near right now. But we need to understand what Jesus meant by Kingdom. First, we need to understand that the Kingdom of God, is embodied in Christ Himself. Jesus, the Messiah, did not come to just be the King, He came to be the Kingdom. He came to establish His Kingdom in our hearts and lives. He came to establish a kingdom, not of this world, but in this world through the hearts and lives of disciples and followers who pray this prayer and invite the Kingdom of God to come. Thy Kingdom come. The kingdom draws near when Jesus draws near. And so we begin the year celebrating the birth of Christ into this world. In the course of my studying for this message, I looked up “kingdom of God” in my Bible dictionary and it defined it this way: The Kingdom of God is a messianic kingdom in which Christ is the kingdom of God. The Messiah does not come to bring the kingdom – the Messiah comes to be the Kingdom. To who? Well scripture tells us that the Kingdom comes to those who repent. And remember, repent means “turn around.” In essence, Jesus is telling us to “turn around” because the Kingdom of God is here. When we pray these words, we are inviting Jesus to “come near” and so we are committing to turn our lives around so we can welcome Him. And so as the year unfolds we celebrate John the Baptist and remember Christ’s Baptism. The Kingdom of God is here – in us – when Jesus is here – in us. The Kingdom has come because Jesus has come. It is not a physical Kingdom, but a spiritual one which is embodied in our belief in and love for, Jesus Christ. The Kingdom comes when we turn our lives around and embrace Jesus Christ as our Lord and King. And then secondly, these words are an acknowledgement, that the Kingdom will come, because Christ will come again. And so at Easter we celebrate resurrection and ascension and the anticipation of Christ’s return. One of the great promises of the New Testament is the second coming of Christ and that when He comes again, He will establish His Heavenly Kingdom on earth. 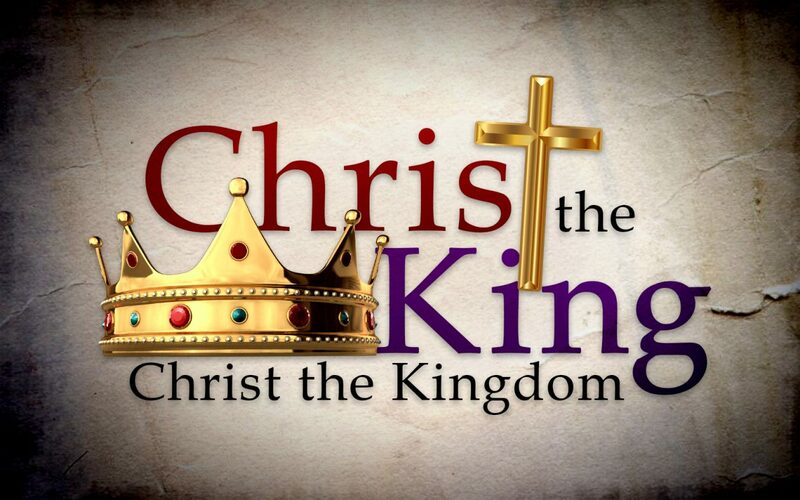 When we pray Thy Kingdom come on earth as it is in heaven we look forward to and anticipate the day when Christ will come again and the Kingdom will transcend the Spiritual realm and Christ will rule forever. It is the great hope of the Christian faith. Christ embodies the kingdom of God – and likewise, the Spirit of Christ is embodied within the hearts of each of God’s children. Christ in us makes it so. And by God’s transforming grace, His kingdom knows no borders. It comes and goes wherever we Christians come and go. If you pray this prayer, you are praying for a kingdom to come upon the earth that will radically transform human life. Life in the world is dominated by greed, self-centeredness, pride and arrogance. It is out of step with the kingdom of God. Within the kingdom – faith, hope and love abide. To pray ‘Your kingdom come. Your will be done, on earth as it is in heaven’ is to march to the beat of a different drummer. Jesus in the sermon on the mount, best describes those who seek to live within the kingdom. The poor in spirit, the meek and humble will inherit the kingdom rather than the arrogant and the selfish. Peacemakers will be the children of God. The members of the kingdom are those who are persecuted for their commitment to righteousness, goodness and love. When we pray, “Thy Kingdom come”, we are praying Thy Kingdom Come right now, in my heart and life. We are praying that God will make His kingdom come in our lives because the kingdom of God is present now, even in the midst of a world that seems to be more and more out of touch with God. Which leads to the final truth that we need to see, and that is that the kingdom of God is a reflection of the will of God. For the Disciple God’s Kingdom and God’s will are one and the same. Jesus is telling us that God’s kingdom cannot come unless and until God’s will is done. The kingdom is the reflection of God’s perfect will. On earth and in Heaven. And the hard truth is that we cannot be a part of God’s Kingdom unless we place our lives in His will. Jesus said, “Not everyone who says to me, “Lord, Lord” will enter the kingdom, but only the one who does the will of my Father in heaven.” Jesus Himself knew the glories of the kingdom, but He also knew the struggle and the pain that sometimes comes with citizenship in God’s kingdom. The greatest example of this was in the Garden of Gethsemane when he pleaded with God to spare Him from the Cross, but in the end the Kingdom comes. “Not my will, but yours be done.” Jesus says. And that’s the struggle we all face. William Barclay once wrote: every person has his private Gethsemane, and every person has to learn to say, ‘Thy Will be done” if we truly pray thy Kingdom come. But that’s hard isn’t it? It’s hard to discern what God’s will is for our lives. If only there was a clear cut formula for discerning God’s will. Perhaps you’ve heard of the man who was desperately seeking to know the will of God for his life. And one day he heard a preacher describe the “Open Window” technique. The way it went was, you placed an open Bible by an open window and waited for the breeze to blow the pages. And when the breeze stopped, you close your eyes and place your finger on the page that the Bible had blown open to, and whatever verse you placed your finger on would reveal God’s will for your life. And so the man tried it and the verse his finger settled on read, “Judas went and hanged himself.” Well this couldn’t be right, he thought, so he went through the whole process again, figuring that he hadn’t allowed enough time for God to blow on the pages of the Bible. Well, this time the verse his finger rested on read, “Go and do likewise.” Well, confused and a little paniced he decided to give it one more try, and the third time his finger rested on a verse that read, “Whatever you will do, do it quickly.” And so the man shut the window. Most of us struggle to understand God’s will for our life. There have been times in my life when I have thought that God’s will is a great secret that would not be revealed without a great deal of struggle on my part. That for some reason God withholds His will from us and will not let go of it without a great deal of wrestling on our part. Have you ever felt that way? When confronted with a major decision about vocation or relationships or other things in your life, you question what God’s will is. But you know, after years of such struggles, I have come to a great revelation in my life. And that is that God does not work that way. The question was not what God’s will was for my life. It was how could God’s will best be lived out in my life. I really knew what His will was for me but I didn’t want to accept it. When we pray Thy Kingdom come, we are asking that God establish His kingdom in our hearts and our lives. And the choices we make from that point forward are based on which direction will we take that will provide us the greatest opportunity to live out that Kingdom in our lives. God’s will is not that we struggle. God’s will is not that we have hurts and conflict in our lives. God’s will is that we love others through Him and that we know He loves us. His Kingdom is one of unconditional and unending love. That’s why the Apostle Paul can say, in the midst of the pain and suffering of his life, even while awaiting death in a Roman prison, all things work for good for those who love God, who are called according to His purpose. You see, Mr. Brown was wrong. It was a great day of celebration. Because he was wrong in thinking that all of what he had done up to that moment separated Him from God because once he was baptized and accepted Christ as HIS king those earthly kingdoms did not. What mattered was that God’s kingdom had come to him that day. He had been cleansed of the world in the waters of Baptism and taken his rightful place in God’s Kingdom. You may have come here this morning feeling as though you were about as far from God’s Kingdom as you could possibly be. Struggling to find your way. But in the moment that you pray this prayer, Thy Kingdom come. Thy will be done. You can put all of that behind you. In the waters of Baptism you put all of that behind you. And this will be a great day of celebration, here on earth as it is in heaven. Oh Lord Thy Kingdom come, again and again and again, until all other Kingdoms fade away and Your Kingdom is established here on earth as it is in Heaven.